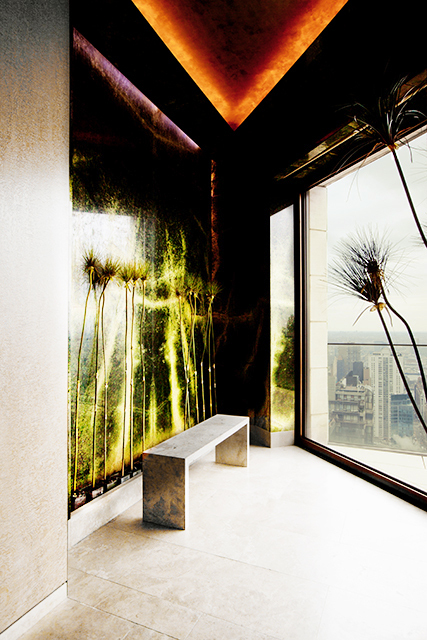 , the 52-floor Art Deco-inspired, five-star establishment includes 63 suites and 305 guest rooms. Shortly after Ty Warner acquired the property in 1999, he enlisted Pei and Marino to create the now iconic penthouse in the city's tallest hotel. Taking seven years to complete, the 4,300-square-foot suite has nine rooms, ceiling heights of up to 25-feet, 360 degree views, and four glass terraces that sit 700 feet above the street. also designed the Royal and Presidential Suites. The company's other projects include Ermenegildo Zegna, Chanel, Christian Dior, and Louis Vuitton boutiques.